A mass proliferation of devices, remote workers and productivity apps has made workforce modernization a top priority. But supporting and securing an increasingly remote workforce has become more resource-intensive than ever. And it’s added complexity to IT professionals’ roles — especially as expectations rise for them to both manage today and drive business transformation. Device as a service (DaaS) has emerged as a powerful way to control costs, match the right the devices to the right roles, and free IT teams to focus on strategic initiatives. 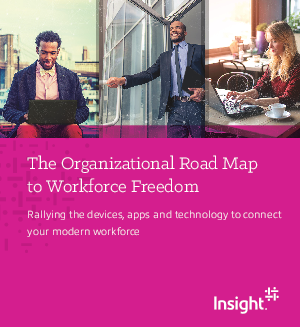 In this ebook, learn how Insight Managed Office helps your teams connect your workforce and drive agility through three key areas: devices, applications and managed support services. You’ll learn key considerations and take a deeper dive into cloud-based app security through Microsoft InTune, auto-provisioning and more.